Life as a Jane Doe: i won a giveaway!! I feel like a complete and utter dork right now because the excitement I feel right now from winning a giveaway is beyond normal! I nearly fell off the couch when I saw I was the winner! I never win anything. I have entered hundreds of giveaways over the course of my blog life and nothing, zip, nada. Poor Rhonda got the brut of the spaziness last night when I saw Shasta's blog post that I had won the giveaway. The dear, sweet girl found my blog by her posting and e-mailed to tell me congrats and that she loved my blog! And somehow in my excitement, I got confused because I read that Shasta would be e-mailing me soon. So, I got this e-mail from Rhonda and I went off saying I'm so excited and glad you love my blog and and I'd like the pink please and here is my address. Hahahaha... I apologize again, Rhonda! I'm kind of glad that I never won any giveaways before now because my luck surely isn't good enough for me to win more than one in my lifetime. And I really, really, really wanted to win this one! I had horrible acne as a teenager and went through the lovely experience of Accutane. The miracle drug (minus the whole severely chapped lips, hands, and feet, mandatory monthly pregnancy tests, the requirement of taking prescription birth control to ensure that I don't get pregnant and have a baby with no limbs, mandatory monthly complete blood work - three huge tubes to ensure my organs were working properly, and the millions of other severe side effects including but not limited to bouts of paranoia, psychosis, and suicidal thoughts- thing....) cleared up my skin like... well... like a miracle. I rarely ever have problems with acne now... but I do have very slight scarring from the acne and troublesome blackheads in my t-zone area. With the help of my new Clarisonic Mia I will be able to clear up those pores in my t-zone and hopefully find a product that will help with the few scars I have... can anyone suggest a product they know works well? Sweet girl! I love this post! 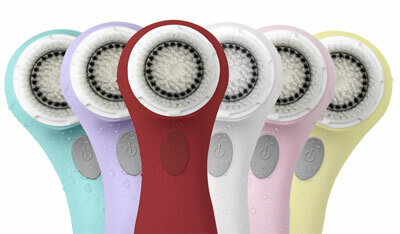 : ) The clarisonic was your destiny, after reading everything that your skin has been through, you so deserve it. Accutane is MAJOR, a lifesaver for so many. I work in the skincare world, for a dermatologist. I am so happy that blogger led me to you! Loving your blog and the story about Rhonda is hilarious! Rhonda is my friend, so this just was so meant to be! Btw, R is pretty wonderful! Gosh, that Accutane sounds insane! Seriously, that email exchange with you made my day. It was hilarious how excited you were! Aw, Shasta, you're the sweetest!